Your retirement years should be about taking things easier and making sure you have all the time to do the things that you want to do – whether that’s trips abroad, spending more time with the family or enjoying new hobbies. What you don’t want to be is bothered by unexpected and costly repairs on your home, or downsizing to an older property where problems start to show after you move in. This is why choosing a new build purpose built retirement property in later life gives you peace of mind that you have chosen a home that is a pleasure to own and not a burden. You may think of older properties as robust and reliable, but in reality they are often inefficient to heat, expensive to maintain and often in need of attention. Imagine moving into a brand new home, with the latest contemporary specifications, that has also been designed to be easy to manage and economic to run – and all the external maintenance is taken care of for you. 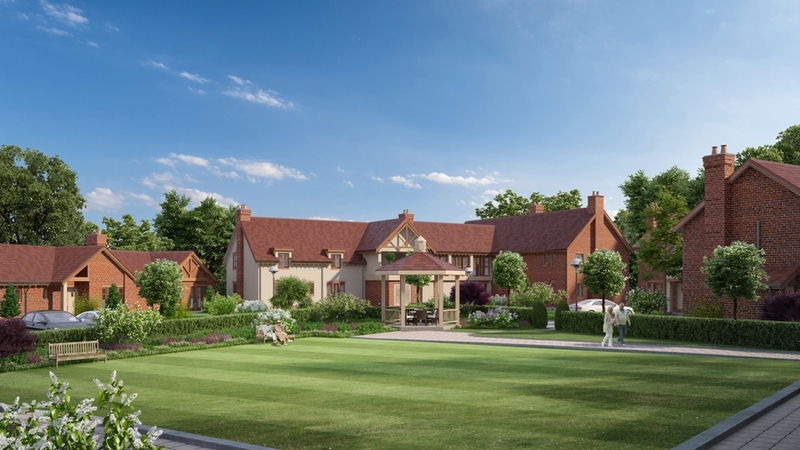 Within a few weeks of moving into a new retirement home, an overwhelming proportion of buyers state that they wished they had made the move earlier because they cannot believe how much better, easier, simpler, livelier and happier their lives have become. Families also have peace of mind because they know their relatives are in a modern, safe and low maintenance environment, surrounded by like minded neighbours. In addition to the host of lifestyle and well-being benefits on offer when you move to Albany Meadows, there are also some big practical advantages when you choose to buy a new build home. Guarantees: All the homes at Albany Meadows come with a 10-year Building Life Plans (BLP) warranty covering certain defects that occur in the first ten years of completion of the build. Ease of purchase: There’s no upward chain to contend with when you buy a new-build home. Buying a new home means you eliminate this element of uncertainty and you won’t have to worry about the seller’s end of the deal falling through. As well as being convenient for you, this can also be an attractive hook for buyers of your own property as there is no forward chain. Or to make life even easier, you can opt for a completely hassle free sale, with no risk, by choosing our Part Exchange option for a guaranteed sale of your existing home. There are also no survey issues or fees associated to buying a new build, and as a developer we are proud to conform to the Consumer Code for New Homes, established to ensure that best practice is followed in respect of the marketing, selling and purchasing of new homes, and also sets out standards for after sales customer care services – a private vendor does not have to comply to such rules so there is still an element of risk. Choice: If you decide you love the location and style of homes at Albany Meadows, you are not limited to what home might become available. By buying early in the process you have a choice. From style of home (apartment, bungalow or house) to where it is located in the development and what style of outside space you’d prefer. You could say you are spoilt for choice. Future proofing: Our homes are modern and spacious with a luxurious feel, so there’s no need to feel that by moving into one you’re accepting your advancing age, and of course you can still decorate your own home in your own style. But you will reap the rewards of forward planning, because when you can no longer ignore the impact of getting older, the benefits of a retirement property really come into their own. Our properties are built to help people live independently well into later life, so you can avoid worries you’d rather not think of now, like having to modify your home for mobility purposes or needing to install emergency alarms, or the emotional and physical upheaval of moving home at an advanced age – as your new build home is prepared for any future events, ready to adapt to your needs and with support and care services available to you in your own home if and when you need it. If a new build home at Albany Meadows sounds attractive to you, we’d love to show you around the show home and development and tell you more about living here. Get in touch with our sales consultants who would be delighted to arrange a time to show you around.